What a miserable day it was for my photo shoot at the weekend. 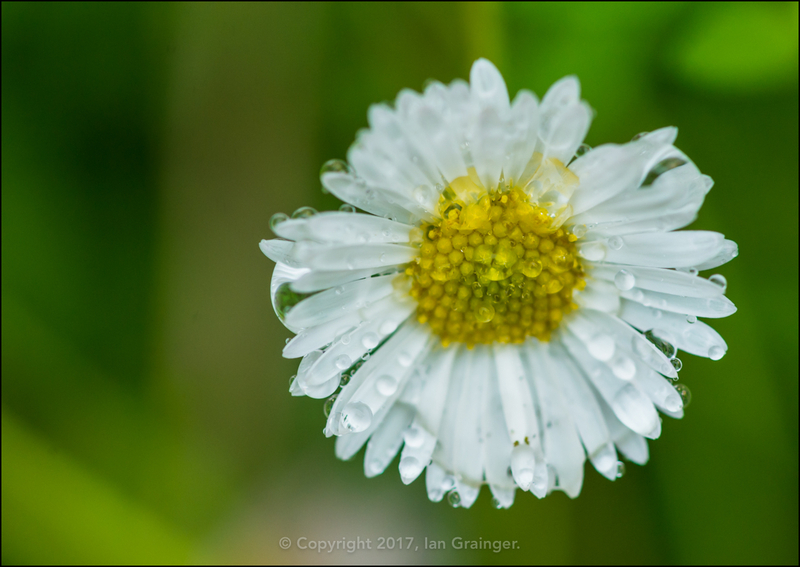 It was cold, wet and very windy, so definitely not ideal conditions to be taking photographs in. This was reflected in the fact that the majority of shots I took were either blurred or uninspiring. However, there were a few exceptions, which are presented here. 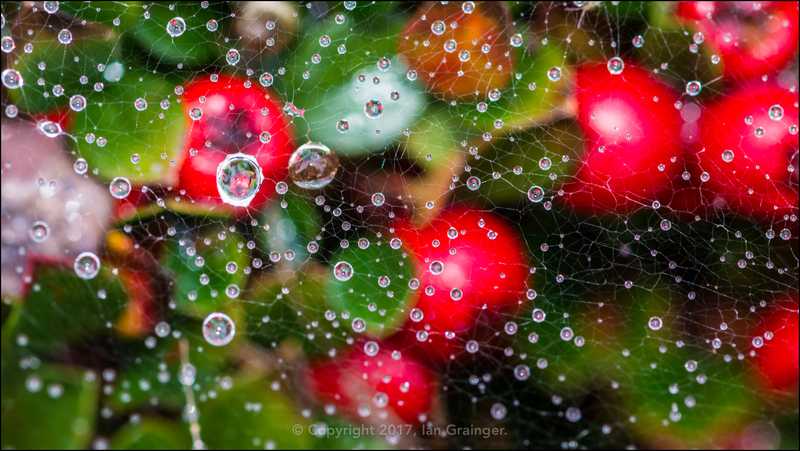 I thought that the best of the bunch, and probably the most colourful, was this raindrop loaded spider web that was sitting above some bright red Cotoneaster bush berries. 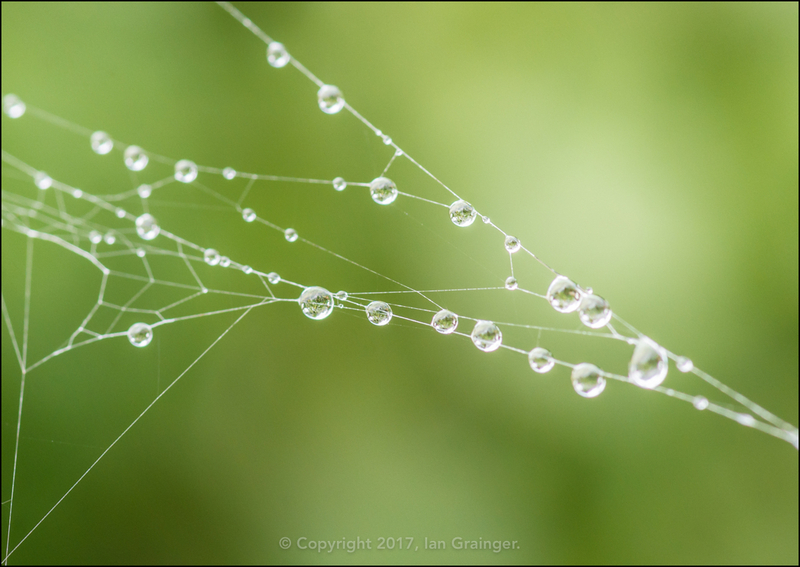 Spider webs were probably the only thing in the garden that weren't blowing about furiously, so I shot quite a few of them. This one was a work in progress by an industrious Garden Spider (Araneus diadematus). 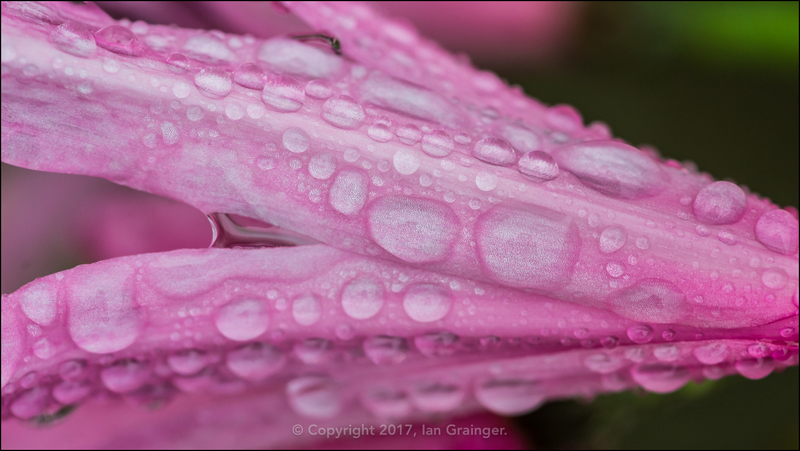 You may have guessed by now that raindrops are going to feature prominently in this week's article? 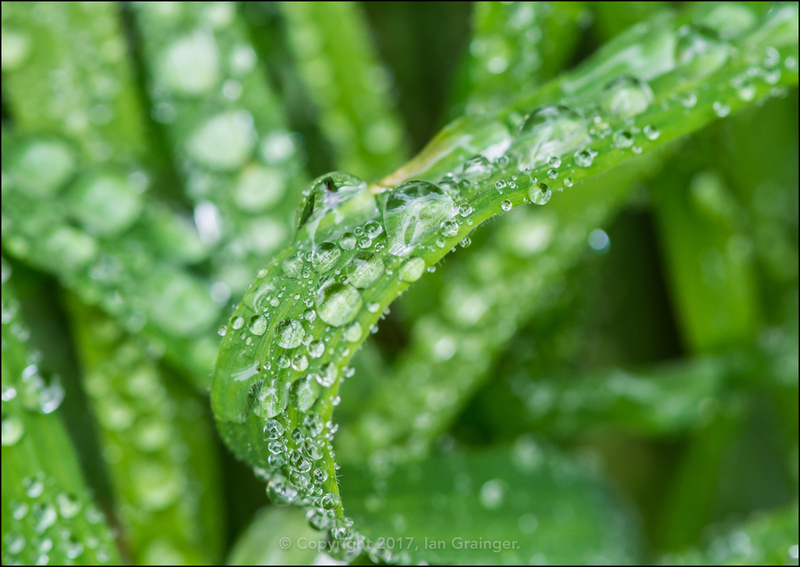 I loved how fresh looking they made these blades of grass look. 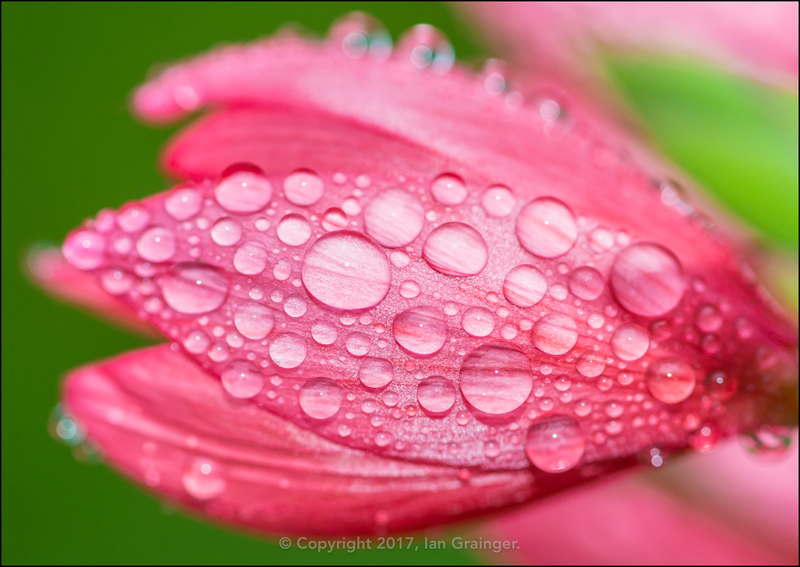 ...and the same can be said of the beauty of these Guernsey Lily (Nerine bowdenii) petals too. 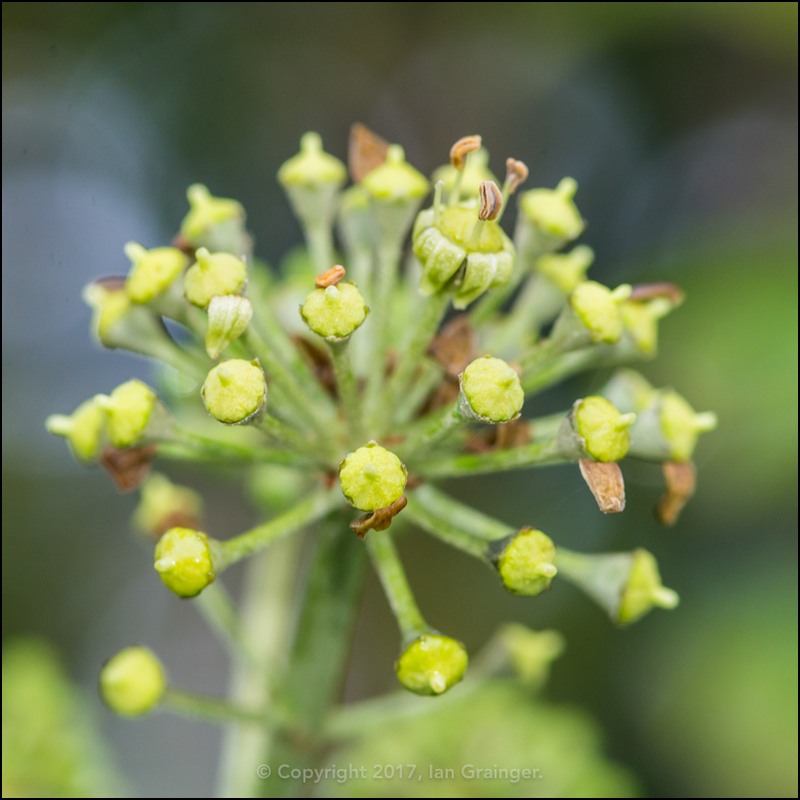 The Flowering Ivy (Hedera helix) flower buds were just on the verge of opening, although I'd have advised them to stay tightly closed because of the foul conditions. 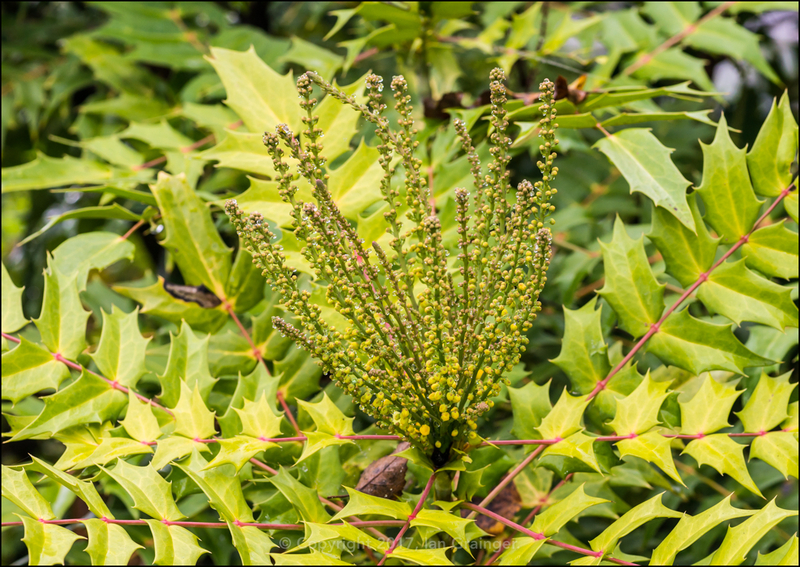 Another shrub ignoring my advice, and just coming into bloom was the Mahonia japonica. It was a little early this year, and it would be interesting to see how long lived the blooms would be, as they usually lasted well past Christmas and into the New Year. 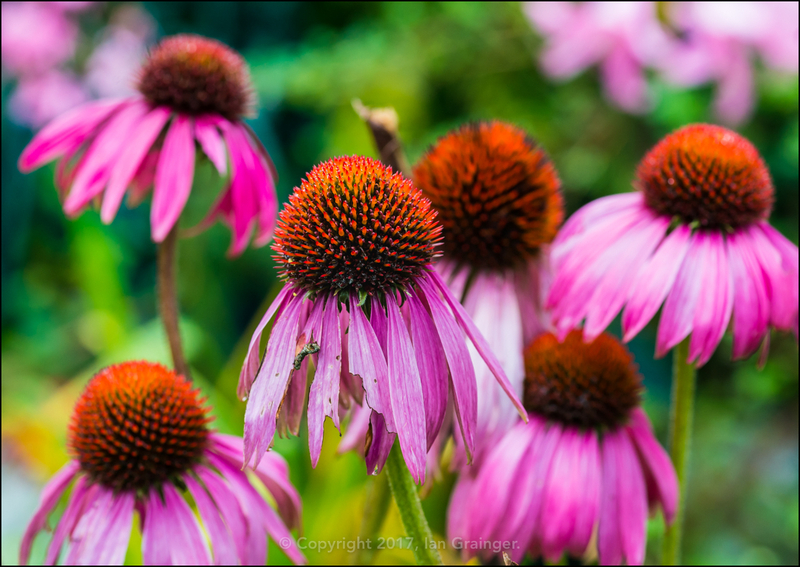 Some blooms still going strong were the Coneflowers (Echinacea). I thought that they were looking great all grouped together. However, they were a nightmare to photograph as they swayed around on their long stems with top heavy flower heads. 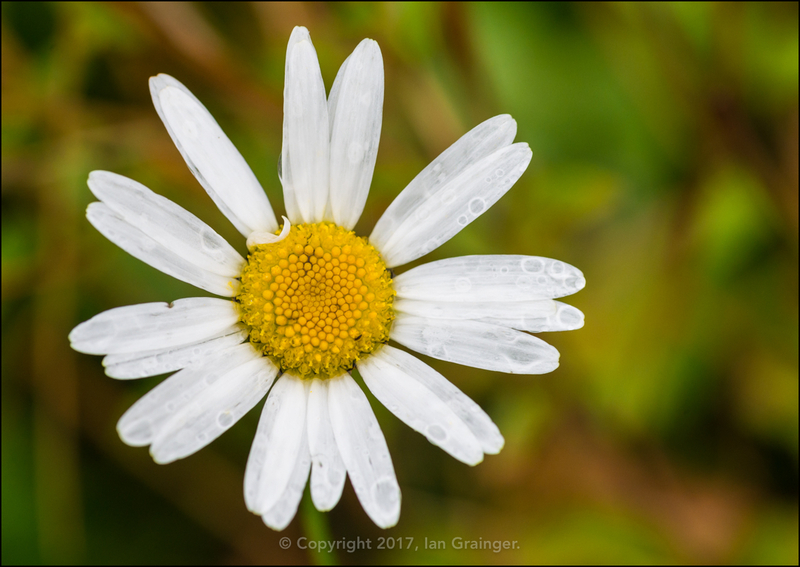 ...as were the Oxeye Daisies (Leucanthemum vulgare), which had now been flowering for months and months. 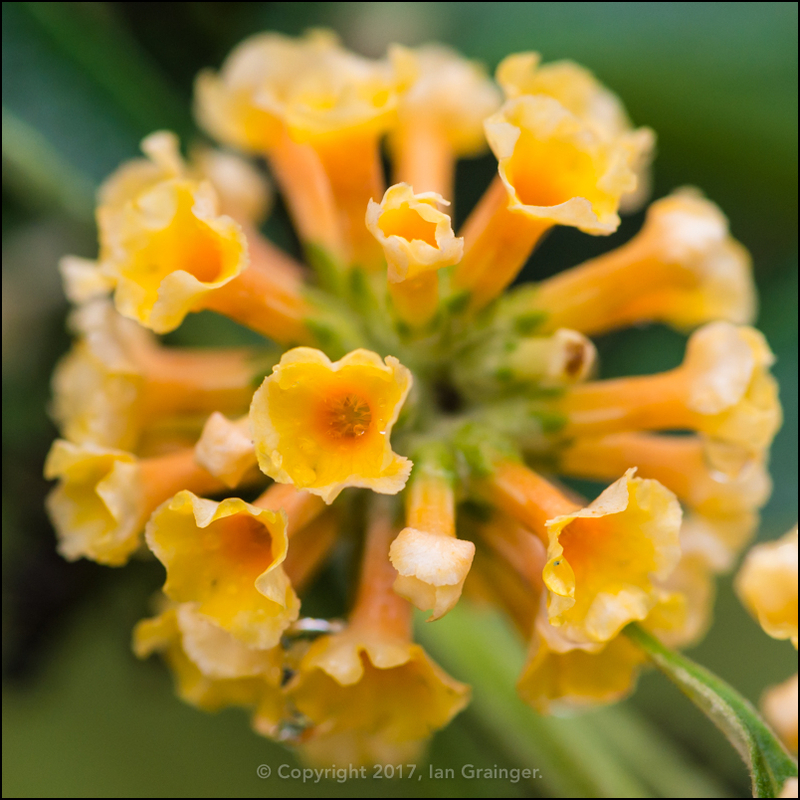 The large yellow Butterfly Bush (Buddleia) looked to be coming to an end of its flowering period, with only a handful of branches still bearing unopened flower buds. 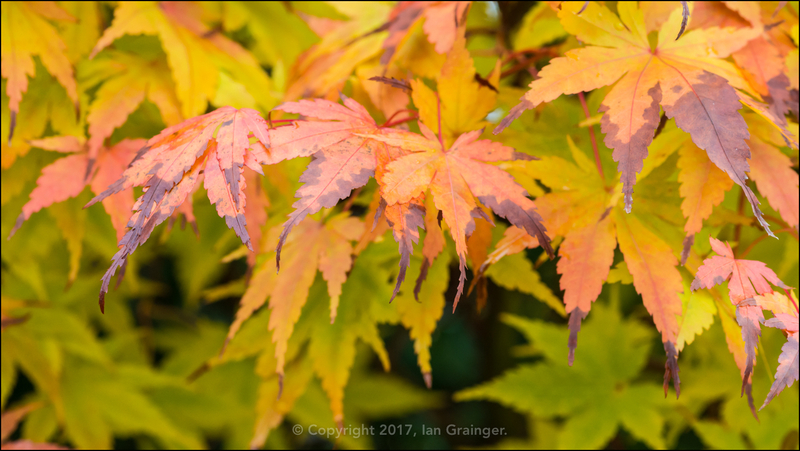 Autumn had definitely arrived, and to prove it, the leaves of this Acer palmatum tree were all dressed up in their autumnal gown. 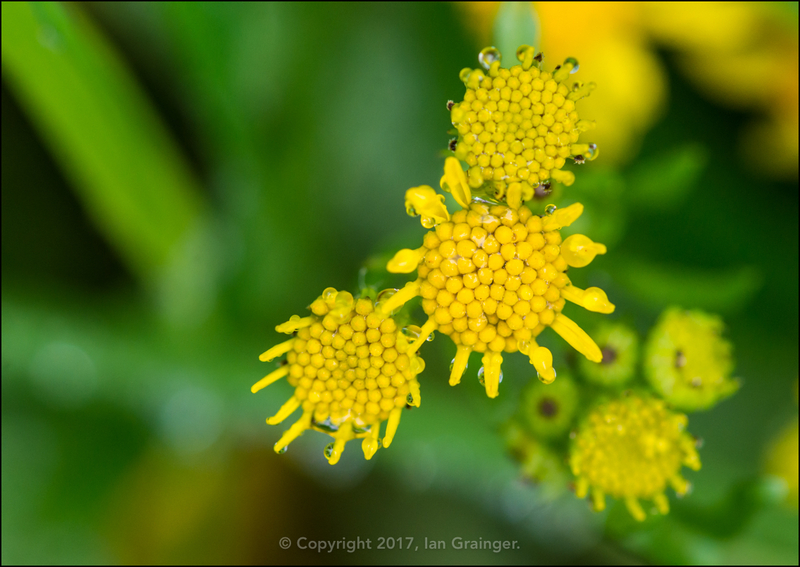 There were a few areas of Ragwort (Senecio) left in the garden for the insects to enjoy, but the terrible conditions meant there weren't any insects around to photograph. 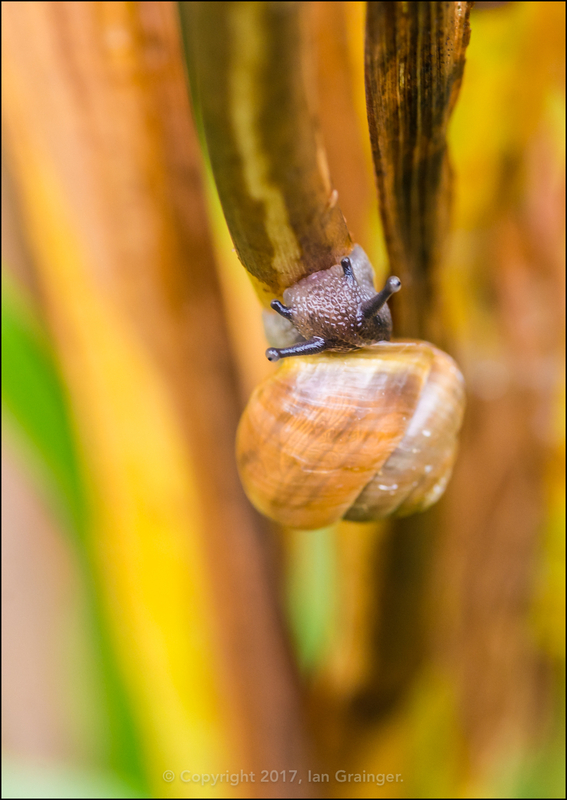 Snails (Gastropoda) were the only wildlife I came across on my wet and windy photo shoot. This one, which I think is a White Lipped Snail (Cepaea hortensis), was happily munching on the decaying leaves of an Flag Iris (Iris pseudacorus). Finally, I thought I'd include a couple of shots of some new aquatic friends. 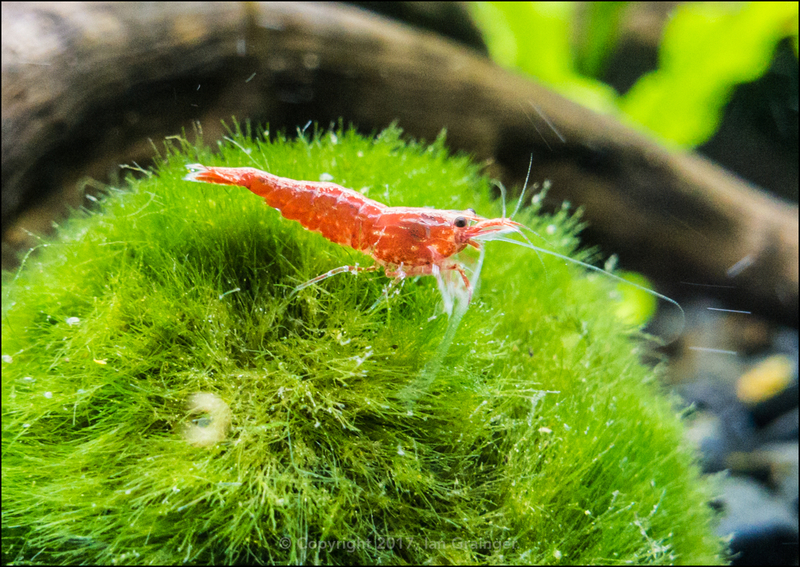 This is a Red Cherry Shrimp (Neocaridina davidi) filtering food from a Marimo Moss (Aegagropila linnaei) ball. I recently introduced a small colony of these beautifully coloured little shrimp into one of my aquariums and am hoping they will breed. 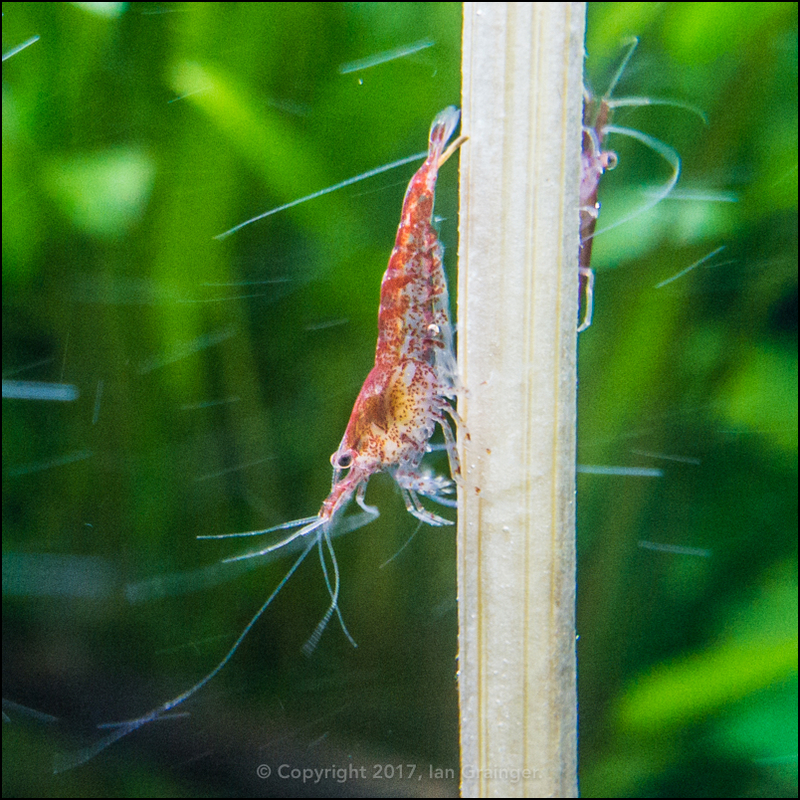 Here's another one climbing down a toothpick, which is securing a piece of cucumber to the substrate of the aquarium. They really are rather pretty don't you think?